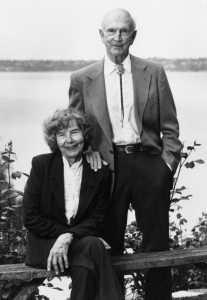 The Helen and John Schilling Endowed Lectureship was established by the late Helen Schilling to bring distinguished scholars to the Department of Surgery at the University of Washington, and to enhance the Department’s commitment to the highest standards of patient care, teaching, research and scholarship. It was Mrs. Schilling’s wish that the lectureship be named in honor of her husband, John. Dr. Schilling devoted his life to academic medicine in a career spanning 50 years. He was born and raised just outside Kansas City, Missouri, and at the age of 15 entered Dartmouth College. After graduating from Dartmouth in 1937, he attended Harvard Medical School as a member of the class of 1941, the last class to graduate before World War II. In the six months before the start of his internship and residency at the Roosevelt Hospital in New York City, he signed on as a ship’s doctor on the schooner Effie M. Morrissey for a scientific expedition to the Arctic sponsored by the U.S. Bureau of Standards. After a number of perilous adventures along the Greenland coast and in the Hudson Straits, he returned to New York and started his training in general surgery. He joined the surgical staff at the University of Rochester in 1945 where he began his life long work on wound healing. His career at Rochester was interrupted for several months by a stint in the central Pacific (Eniwetok) to participate in the study of flash burns as part of the atom bomb tests and the Manhattan Project. Subsequently he joined the Air Force as a volunteer and set up a surgical department at the new School of Aviation Medicine in San Antonio. In 1956 Dr. Schilling was invited to be the chief of the first full-time department of surgery in the new medical school at the University of Oklahoma. He was successful in recruiting a number of outstanding junior faculty, many of whom have gone on to become chairmen. In addition to his administrative responsibilities, he maintained an extensive research program in wound healing in collaboration with Dr. Betty White. At the end of 18 years Dr. Schilling and his faculty had trained 75 surgeons from Oklahoma and adjoining states and had established a department known for its academic accomplishments. Dr. Schilling came to the University of Washington in 1974 as a senior investigator and, upon the sudden resignation of the chairman, was asked to take over the management of the Department of Surgery. Thus began his third chairmanship which lasted eight years until his retirement. His first responsibility was to recruit faculty to fill the many vacancies, a task he achieved after several stormy years. Upon his retirement in 1983, he had recruited 41 new faculty members and graduated a total of 40 chief residents. His career in academic surgery was marked by a devotion to patient care and teaching, as well as research. But, despite his commitment to the profession, Dr. Schilling still found time to engage in other activities. From his early childhood, he enjoyed the outdoors and had become an expert tennis player, skier, and fly fisherman; he always believed that one’s life work should be punctuated by intervals of travel and recreation. Helen Schilling shared with her husband both the non-academic as well as the academic side of his life. They first worked together in Rochester and continued their association through the years in Oklahoma and Washington. They were married in 1979. She had a career in newspaper work and administration after graduating from Oberlin College. This dual background enabled her to be his close associate and administrative assistant for 40 years.